North Korean leader Kim Jong-un has arrived in Beijing for an unannounced visit, at the invitation of Chinese President Xi Jinping. 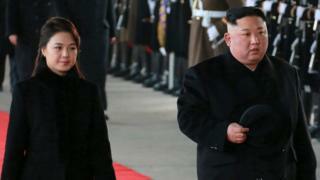 Mr Kim will be in China until 10 January with his wife Ri Sol-ju, according to state media reports. The visit comes amid reports that negotiations are under way for a second summit between Mr Kim and US President Donald Trump. The two met last June, the first such meeting for a sitting US president. Speculation had grown on Monday that Mr Kim was possibly making his way to China after South Korea’s Yonhap news reported that a North Korean train had been seen crossing the border. Dozens of security vehicles and officials blocked roads around the train station in the border town of Dandong. Hotel guests in Dandong had also not been allowed to enter rooms that faced the border, with news outlet Kyodo calling this an “apparent move to prevent the train from being seen”. Both countries media confirmed the visit on Tuesday morning, and Mr Kim’s distinctive green and yellow train arrived at a station in Beijing on Tuesday morning. The train, the same one used during Mr Kim’s first visit to China, resembles the one used by his father Kim Jong-il during his visits to China and Russia in 2011. A motorcade with heavy security was later seen driving through central Beijing. Mr Kim’s visit, during which he is being accompanied by several leading North Korean officials, is his fourth to China in less than a year. Tuesday is also reportedly Mr Kim’s 35th birthday, though his date of birth has never been confirmed by Pyongyang. China is an important diplomatic ally for North Korea, and one of its main sources of trade and aid. “[Mr] Kim is eager to remind the Trump administration that he does have diplomatic and economic options besides what Washington and Seoul can offer,” Harry J Kazianis, Director of Defense Studies at the Centre for the National Interest told Reuters. Mr Kim, unusually, did not meet Mr Xi for the first six years of his leadership of North Korea. But last year, he visited China three times. None of the trips was announced in advance. The BBC’s Laura Bicker in Seoul says two of the trips, which took place ahead of the historic summits with the South Korean leader Moon Jae-in and Mr Trump, were seen by some as a chance to co-ordinate strategy. The latest three-day visit, our correspondent says, is likely to fuel speculation that a second US-North Korean summit will take place soon. Earlier this week, Mr Trump said a location for another meeting between the two would be announced in the not-too-distant-future. Mr Trump told reporters in Washington DC that “a good dialogue” was taking place with North Korea, but that sanctions on Pyongyang would remain in place. In his annual New Year’s speech last week, Mr Kim said he was committed to denuclearisation, but warned that he would change course if US sanctions remained. Did Trump and Kim really achieve anything in Singapore? Diplomatic progress between Mr Trump and Mr Kim has stalled since the Singapore summit. Both parties signed a pledge at the time to denuclearise the Korean peninsular, though was never clear what this would entail.